We’re just a few days away from the unveiling of BTS’ new album MAP OF THE SOUL: PERSONA. The K-Pop Gods drop the collection this Friday (April 12), and they are all but guaranteed to reclaim the number 1 spot on the Billboard 200. All things considered, anticipation is already sky-high to hear with they have in store. But, if possible, the release got even more exciting over the weekend. Why is that? Because the septet revealed that the LP’s lead single featured a contribution from Halsey. 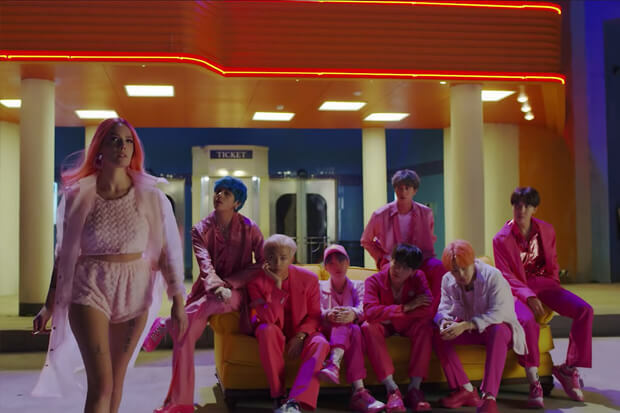 Called “Boy With Luv,” it arrives alongside the album and is sure to be a massive hit. They confirmed the news by sharing a trailer. In the brief teaser the “Without Me” diva closes up shop at a theater’s ticket booth. As she leaves, she looks back on BTS sitting on a sofa in the middle of the street. In another scene, the “IDOL” hitmakers stand in silhouette against a brilliantly lit background as a snippet plays. “Showtime baby,” Halsey wrote in a tweet. Based on what we’ve seen thus far, I wouldn’t be surprised if “Boy With Luv” dominates the Billboard Hot 100. Last year, the group made history when they landed within the Top 10 on the chart with “Fake Love.” They may soar even higher this time around.